There are tons of ways to make money online like advertising on blogs, doing jobs online and so on. I have found a website that will help you to make money online by URL shrinking. You are familiar with many URL shrinking tools like goo.gl, bit.ly etc. They will help you to shrink your URL but will not pay you single money. Here comes the role of adf.ly. 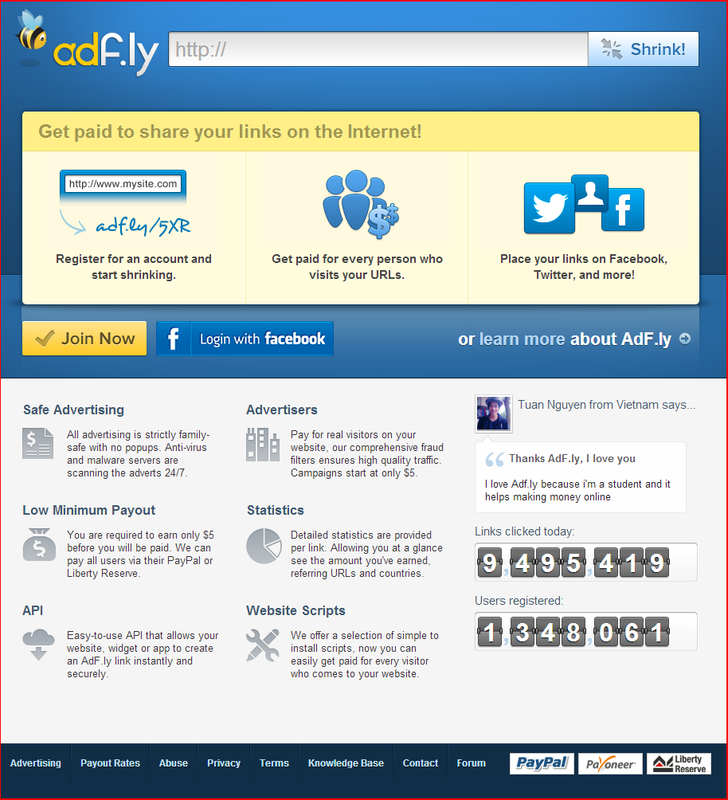 Adf.ly has many tools that will help you in shrinking. It has a mass shrinking tool which will shrink 20 links at a time, a script to convert all the links in your blog to adf.ly, ability to track stats in Google Analytics etc. You can withdraw your money when it reaches a minimum of $5. There are many options to receive payment like PayPal, Pioneer etc. You can log in using your Facebook account or creating an account on adf.ly. Signup and start enjoying. Google plays a vital role in bringing traffic to your blog or website. Google automatically crawl or index most of the websites and show them in search results. But if your blog or website is new, there is a chance of not getting indexed. Go to google’s add URL page. Enter your web URL and enter the captcha. After completing these steps Google will crawling your blog shortly. Now Google will start indexing your website and crawl your website in regular interval. But what will you do if you want to index your post as you publish it? Submitting a sitemap to the Google webmaster tool is the solution. According to Wikipedia, a sitemap is a list of pages of website accessible to crawlers and users. It helps crawlers to index your website or blog fast and help users by providing better navigation. You can create your sitemap manually or using online sitemap generators like Google Sitemap generator. WordPress has many XML sitemap plugins that help you to create sitemaps automatically. I hope you enjoy the post. Please give your valuable feedback through comments. You are very familiar with the autocorrect option of Microsoft that helps you to correct your grammar and spelling mistakes. Today, I have found across the web a simple application that helps you to write words or phrases simply by entering shortcuts named ‘Word Expander’. Word Expander increases your typing speed and thus increases productivity. This application not only helps you to assign shortcuts to words, but also helps you to add an auto correction library. You can then use the shortcuts to type on anywhere including word processing applications like Microsoft Word, simple text editors like Notepad, and on writing fields in web browsers including the email fields. Go to phrases in Word Expander. Add your word and shortcut and press enter. You can also download libraries regarding medical terms from the official website of Word Expander. You can also export and import your libraries. You can add the misspelled words and correction in autocorrect library. The application will correct the misspelled words automatically. If you liked the post follow us on Facebook, Twitter and Google+. The largest social networking website Facebook has many incredible features. One of the best features of Facebook is the ability to show all the coming events of your friends including their birthday and so on. But Facebook’s calendar has fewer features compared to many other calendar apps like Google Calendar, Outlook etc. Will it be great to view all the upcoming events of Facebook friends in Google Calendar or Outlook? Visit that particular event page. Click the settings in the upper right corner. If you liked the post follow us on Facebook, Twitter, or Google+.